With information processing shifting away from the desktop model of human-computer interaction, and towards mobile and ubiquitous computing, a change in paradigms of user input devices is taking place. Yet mobile touch screen devices, such as smartphones, lack a suitable method for text input which can compete with the mechanical keyboards that have already been around since the early days of computing. 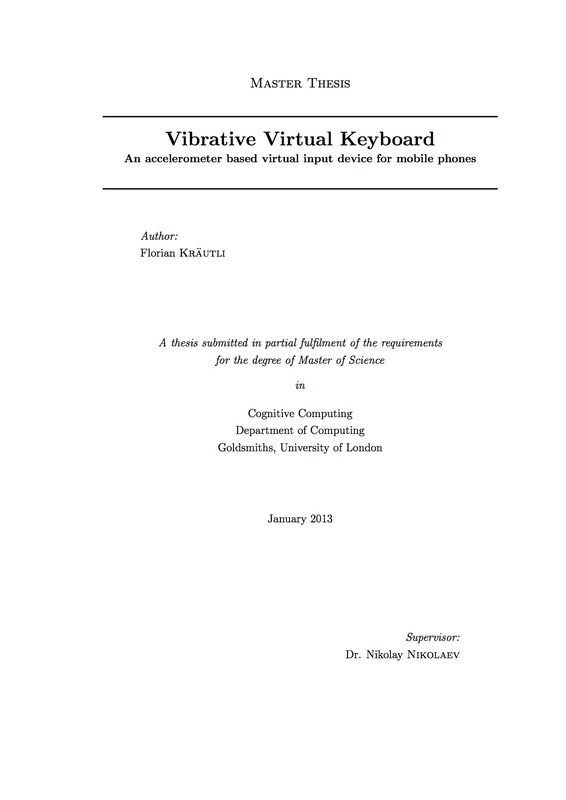 This thesis explores the development of a Vibrative Virtual Keyboard. The system should allow text input on smart phones similar to typing on a physical keyboard, but without any external hardware. Any rigid surface should be turned into a virtual keyboard by analysing the vibrations emanated from typing through the built-in accelerometer of a standard Apple iPhone 4. After an overview of existing mobile text input methods and a review of current developments in the area of virtual keyboards, the system and its components are outlined. A thorough discussion of the theoretical background and a detailed description of the software architecture and implementation follow. The individual components as well as the entire system are evaluated in suitable test scenarios. The evaluation shows that the Vibrative Virtual Keyboard is capable of detecting key strokes with an accuracy of up to 80% and text input of complete sentences is possible. Kräutli, F., 2012. Vibrative Virtual Keyboard. MSc Thesis. London: Goldsmiths, University of London.